Alright, I’ll admit that even though I already own a decent projector I really want an R2-D2 projector. I’m a total star wars geek and love this idea. Besides, it’s got a built in DVD player and ipod dock, what’s not to like… well how about the cost, yikes… but then again it’s not just a projector, it’s an entertaining entertainment stand. Today I recieved a link from a friend of mine today regarding a speech that astronomer Carl Sagan gave back in 1994 comparing our world to the vast expanse of the universe. 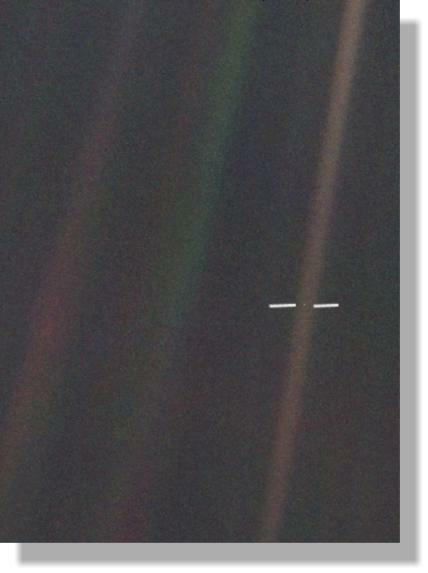 Aside from Carl’s points, I also think this photo demonstrates how easy it would be for humans to miss another potentially advanced culture, seeing that our world can be so easily missed amoung the vast emptyness that is space. Ever wonder how many alien civilizations are out there? Read up on the Drake Equation, it’s an interesting way to quantify the uncertainty of the factors which determine the number of extraterrestrial civilizations that we have a chance at coming into communication with. Speaking of which, I’ve got a few light saber videos myself and a tutorial on how to make them! I must say the choreography is pretty good here and the music is pretty funny. The only thing I would change is place some sparks and flashes into the mix of the saber clashing. I wonder if the two women knew they were going to be turned into internet icons? Dancing Walrus, what a Smooth Criminal! If you’ve ever been to my special effects web site you’d know that I love to create special effects and music videos. You may have even seen my video version of Michael Jackson’s Dangerous song. …but uou probably haven’t seen this: a fat walrus dancing to MJ and doing a pretty good job at that (for a walrus). We need more walruses that do this. Cal State San Marcos Track Video Celebration! Check out the new teaser trailer for 10,000 B.C., it’s looking pretty good but won’t be ready until march of 2008. You can also read the trailer review on cinematical. Ever want to clone yourself on video? Make it look like you had a few extra brothers or sisters hanging around? But how would you make it look real, make your video actually look like you were really able to multiply your body, just like in the Star Wars or Matrix movies? There is a secret that many people do not understand when it comes to cloning objects or people. It is something I learned from trial and error experience and can sum up to you in just one word… “tripod“. Yes, get yourself a tripod for your video camera. Keeping your camera steady in between clone takes is a must and is the key to creating effective and believable clones videos. If you’re interested in learning more about the specifics of video effects cloning, visit my tutorial on creating clone effects. This movie is by far the largest attempt on my behalf to clone something (myself). I started in December of 2004 and finished in March of 2005, filmed this over a period of 5 or 6 different days. I may have spent a bit too much time on it but I think it turned out pretty good. In the end, I had no filming help from anyone except for my tripod - it was my camera man. I bought my tripod at Frys Electronics for about $40 dollars. You can purchase cheap yet effective tripods at just about any major electronics store that also sells camcorders, i.e. Frys, Circuit City, Comps USA, etc. So just remember, if you need to clone something and all else fails, use a tripod. Behold, the power of Photoshop! Check out this funny video of Large Woman growing thinner into a much more attractive looking girl - all from photoshop. One of the many reasons why I love Adobe’s prized program. Disclaimer: weight loss results may vary with expertise in photoshop so get practicing! Can your 12-yeard-old play like a God? For those of you who know me, I love to play guitar. It’s been about 10 years since I picked up my very first electric guitar and started to jam out. And I thought I was good: the Norwegian kid in the following video is only 12 years old yet he plays like a god. He can play Stevie Ray Vaughn’s music flawlessly on the guitar. If you don’t know Stevie Ray Vaughn (SRV), he happens to be one of the most influential electric blues guitarists of the 20th century - also died young in a helicopter crash around 17 years ago.